Olsen’s Winter Jackpot promised to be some exciting barrel racing fun. Olsen’s Barrel Racing Winter Jackpots at Olsen’s Arena in Chino Valley. Come out and show your barrel race skills at these Saturday events. We have divisions for every age and experience level. So whether you are just beginning or have been running barrels for years, there is a class for you. The open arena is from 8:00 am to 10:30 am and the race begins at 11:00 am. There are no pre-entries required and you sign up at the race. Books stay open when the race begins. Not a rider and wondering what exactly is barrel racing and pole bending? Barrel racing is a rodeo event in which a horse and rider attempt to complete a cloverleaf pattern around preset barrels in the fastest time. Men are able to compete now in many of the professional events. Pole bending is a timed event that features a horse and one mounted rider, running a weaving or serpentine path around six poles arranged in a line. 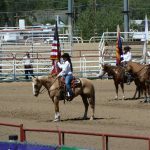 This entry was posted on Tuesday, January 22nd, 2019 at 2:57 pm	and is filed under Barrel Race, Events, Horse. You can follow any responses to this entry through the RSS 2.0 feed. Both comments and pings are currently closed.